You and also start it from the gdb shell using the command "-" (dash). Not sure how to dynamically turn it off though. What is this? What did I do, or, more specifically, how can I get this split-screen mode again? Is there a name for this mode, or somewhere I can read about how to use it? You can trigger it dynamically by push ctrl+x and ctrl+a. There are two variants of it. A screen shot of the view with code and assembly. Also check out this amazing Github project. When GDB is in the standard mode, using win will automatically switch in the TUI mode. List and give the size of all displayed windows. Set the focus to the named window. This command allows to change the active window so that scrolling keys can be affected to another window. Read here form more help. I had the exact same problem when running gdb under emacs: the *gud* window was not responding to commands. 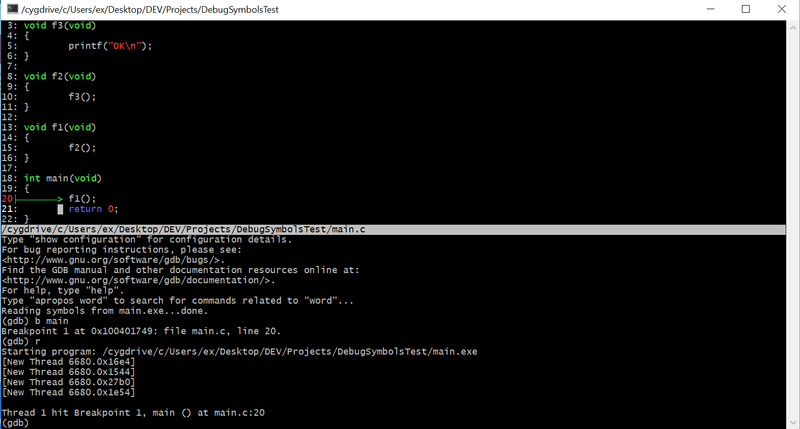 However, ndk-gdb was working well in a shell. To make it work under the emacs gud UI, I had to modify the ndk-gdb script a bit. The --annotate=3 option is mandatory for emacs gud interface, it cannot work without it (that's why *gud* was not responding). But you're halfway. Now it will work, but only if you invoke ndk-gdb while in a buffer from a file at the root of the project (like AndroidManifest.xml). Since this is very unlikely most of the time because you are a C/C++ programmer and the sources you're working on are under the jni directory or deeper, you need to do a little more. The ndk-gdb script is a bit buggy and it will happily confuse you on this one (and gdb itself won't help much either). For some obscure reason, the script DOES NOT cd to the project root directory. This leads to very wrong behaviour when dealing with the gdb.setup file where the script assumes to be at project root. Adding this line will fix it. (assuming your .emacs.desktop is at the root of the project, of course). Now you can finally debug with gud UI, setting breakpoints at source level. Note that I use emacs 23.3.1 (gdb-ui.el), so there is no need to have 24 for this to work. gdb: How do I pause during loop execution? How to close layout SRC windows in gdb?